07 Dec 2018 / 11:21 H.
JERUSALEM: Consider the doughnut. Good, right? Now consider that doughnut made with gourmet ingredients like creme de cassis, stuffed with fresh fruit or topped with chocolate pearls. Really good, right? At this time of year in Israel, that and more can be found. Israeli chefs are giving the traditionally basic Hanukkah doughnut — called “sufganiyot” in Hebrew — a higher purpose as Jews indulge in the sweet, doughy treat for the holiday. “Not only do we use the best products, but we have a secret,“ said Yitzhak Kadosh, chef at his family’s Jerusalem cafe Kadosh, known for its high-quality sufganiyot at Hanukkah time. There is a story behind the doughnuts and the eight-day celebration of Hanukkah, or Festival of Lights, which began on Sunday night. The holiday commemorates one of the great victories in Jewish history, when in the 2nd century BC, after defeating the Seleucids ruling the Holy Land, a small group of Jews led by Judah Maccabee reconsecrated the desecrated Temple of Jerusalem. Tradition says that when they sought to relight the temple’s menorah, only one day’s worth of undefiled oil remained. It miraculously burned for eight days, allowing time to prepare more oil. To mark the holiday, Jews light one candle on a hanukiah candelabra each night. The traditional hanukiah includes nine branches, with one serving to kindle the others. Here’s where the doughnuts come in. It is also part of the holiday tradition to eat foods fried in oil, including sufganiyot. The basic jelly-filled sufganiyot and variations on it can be found all over this time of year, with colourful rows of them set out on tables at cafes, shopping malls and market stalls. But some have sought to turn the doughnuts into a product if not as miraculous as the miracle Hanukkah celebrates, then at least something that’s really worth savouring. For Kadosh, a regular doughnut just won’t do — at least not when it’s time to celebrate Hanukkah. The 46-year-old who has studied in Paris and Vienna won’t give away his secret, but explained that it involves a way of keeping his doughnuts from becoming too greasy. Last year, Kadosh cafe celebrated its 50 years in business by offering 50 different versions of sufganiyot. Among its most original creations have been doughnuts made with creme de cassis liqueur, salted caramel, pistachio and pastry cream. Kadosh sells between 2,000 and 3,000 doughnuts per day during the Hanukkah season — though with the higher quality comes a higher price. They run from seven shekels ($1.90, 1.65 euros) for the classic doughnut filled with strawberry jam to 16 shekels for the more sophisticated. Elsewhere, most sell for between five and 12 shekels. 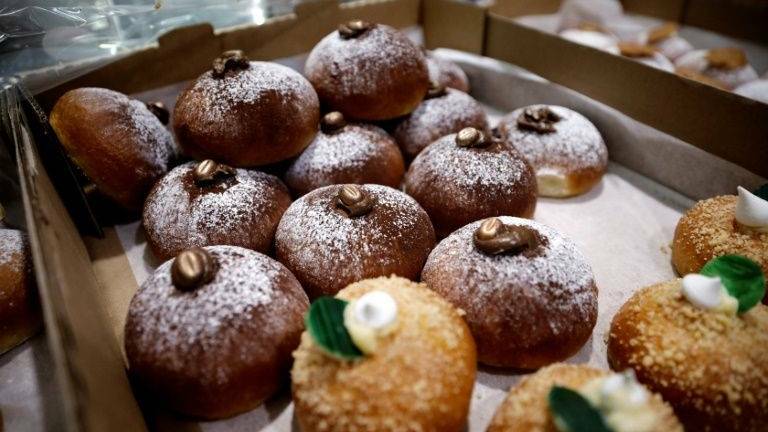 In total, around 20 million sufganiyot will be sold in Israel during Hanukkah, according to an industry association. The doughnut tradition has been written about since the Middle Ages, but dates much further back than that. They would be recognisable to much of the world — cousins of the American “donut” and the German “Berliner”, for example. After stores begin stocking them in the run up to Hanukkah, Israeli newspapers start rolling out their annual lists of the best, the least fattening and the most original. At Jerusalem’s Franck Delights, whose chef arrived from France 22 years ago, fewer than 10 different doughnuts are offered, but the bakery highlights its French roots. “We offer light doughnuts that allow several to be eaten — real pastries with a French touch that Israelis appreciate,“ said Samantha Assuli, the store manager and wife of Chef Franck. 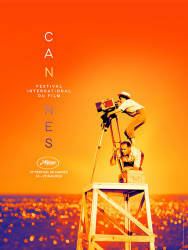 The gourmet examples have become numerous: raspberry, mango, lemon, hazelnut, almond, vanilla cream — even baba au rhum.